The productivity and energy they bring to bear is far higher than office workers doing the same thing. Looking at all these busy coworkers had us wondering – What’s the magic potion that makes coworkers more successful? There’s hard data to prove this – the annual Deskmag surveys show that cowork startups are 4 times more successful. 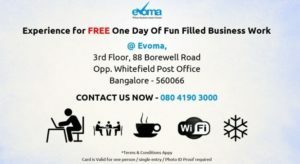 Why are startups more successful at Evoma? Call now – 080 41903000 to join the Evoma community. So we decided to look for studies that explain the success of coworkers and coworking. They prove beyond a shadow of doubt that coworkers are a highly productive lot, and also explain why. Researchers from the University of Michigan’s Ross School of Business found that the average levels of thriving of coworkers was six, on a scale of 7. That’s at least 1 point more than employees in regular offices. People in coworking spaces see their work as meaningful. In the study summary, the researchers note the importance of the work environment and experience. But they also add that what matters the most in terms of impact on levels of thriving is that coworkers have substantial autonomy and they can be themselves at work. This study was a part of the effort to make productive reuse of a shuttered government facility in California. The researchers looked at 9 coworking spaces in California, and part of the study scope was to understand what makes a coworking space successful. Community – 96% of coworkers chose community as the most important aspect of coworking. Community Management – The main component that facilitates successful coworking spaces. Coworking software – One hallmark of successful coworking spaces was the use of software to efficiently manage operations. Marketing – Most successful coworking spaces began their marketing and word of mouth campaigns months before opening. The Agora Collective coworking space in Berlin was actually a metal tools factory before it became a housing scheme, and then gradually turned into a full-fledged coworking space as the space owners took over more and more of the housing space. A study of its growth showed that a big reason for Agora’s success was the fact that they combined coworking with art, food and community events. The coworking space building also houses a program for artists in residence, and their cafe was used to host cooking events for the community. They also hosted workshops and other community events within their space. All this lead to greater acceptance and awareness of the business among people in the area, and has led to the business becoming more successful and the recipient of an EU funding award for its integrative approach.